Safaricom Limited is a telecommunications company, the largest mobile operator in Kenya, serving over 20 million customers and occupying two-thirds of the market share in the industry. The company strives to push the boundaries of conventional ways of doing business by focusing on value creation to the society, economy, and environment of Kenya by incorporating the top-down, bottom-up approach to integrate the SDGs into its corporate strategy and its corporate social responsibility projects. The mission of the company is transforming lives, and this is evident from its operations and investing resources in sustainable projects. Safaricom Limited is a telecommunications company, the largest mobile operator in Kenya, serving over 20 million customers, and occupying two thirds (67%) of the market share in the industry. The company was started in the year 2000, and it seeks to enrich the welfare of not only Kenyans, but also its other clients around the continent, through services that add value and constant support for community projects. It not only operates in Kenya, but across Africa. The company provides converged communications, financial services and broadband internet. Safaricom Limited is also one of the companies (400 companies) across Africa, whose annual revenue is more than $1 billion dollars (Safaricom Limited, 2018). The company has 4,245 permanent employees, 825 employees on contract, however, the number of the permanent employees decreased by 1% in 2017. The company’s workforce is evenly split between men and women; although there are fewer women in the senior management positions, only 31% (Safaricom Limited, 2018). The mission or the statement purpose of the company is Transforming Lives, and this is evident through its efforts to upgrade the livelihoods of Kenyans through support for community projects. The company invests a unique way through this purpose to enrich, create opportunities and empower Kenyans, by providing them the tools for economic growth. One of the first innovations of the company was the ‘Simu ya Jamii’. This enabled Kenyans to earn money by operating the small mobile pay phones. Many lives were transformed, and there was a significant economic growth and freedom witnessed in the country. M-PESA is possibly one of the most successful innovations for Safaricom ltd yet. This service has more than 17 million subscribers (Safaricom Limited, 2010), which is supported by an agent network across the country and even beyond (Safaricom Website). Recent reports show that the network agents have more than 79,000 M-PESA outlets in the country. The M-PESA service provides mobile banking services to its clients whereby; customers send and receive money and make money payments. This service is the world’s largest and most developed mobile payment system. M-SHWARI is the latest product which allows customers to gets loans and savings options, while earning an interest. All of this is done at the comfort of mobile phones. The business model of Safaricom Limited does not only rely on its provision of network services, but also through relationships with its customers, M-PESA agents, business partners, dealers and stakeholders, who, together, bring about the processes of consumer business, financial services, regional sales and operations, enterprise business and support services. Through these processes, there is an output of pre-paid and post paid voice call plans, mobile money transfer (M-PESA), mobile data, fixed services, messaging and devices (Sustainability Report, 2017). All these outputs ensure that there is value for shareholders, through the annual revenue, value for the Kenyan society-through its CSR projects and finally the integration of the sustainable goals in its business and corporate strategy. There is a paradigm shift on how businesses impact the society. CSR has been at the side-lines of decision making, not until recently, when shifts in governance, behaviors of investors and consumers are forcing companies to integrate CSR as the core of their decision making. This is evident by the fact that most businesses are embracing the methodology of impact management and evaluation, with regards to how a product or service that they provide impacts the society positively or negatively. The shift is moving towards the UN Sustainable Development Goals (SDG’s), which are used as a framework to understand and report on the impact of the products and services. M-PESA: M stands for mobile, and pesa is a Swahili word that means money. It is a mobile application, where Safaricom’s subscribers can do money transactions between themselves or with the bank. 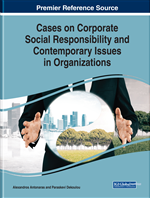 Corporate Social Responsibility: Projects or initiatives undertaken by an organization, for the benefit of the society. Afya: This is a Swahili word that translates to “health” in English. Sustainable Development Goals: Commonly referred to as SDG’s, this is an agenda by the United Nations, in an effort to end poverty and ensure equal opportunities for everyone, in terms of health, education, justice among others. M-Tiba: A mobile application, where subscribers can save and borrow money for health purposes. It mostly targets people who cannot afford health insurance in Kenya. Sustainability Framework: A planning theory in the activity of an organization, involving the management, so as to have a positive impact in the wellbeing and health of people and the environment. m-Health: This is a mobile application that provides various health solutions, like information, savings and credit options, among others, by use of mobile phones. Simu ya Jamii: One of the first products of Safaricom Limited, which was a community phone, used by those who could not afford a mobile at the time.